Ocean View Condo for Sale Playa del Carmen – Gorgeous Penthouse with PRIVATE rooftop pool! 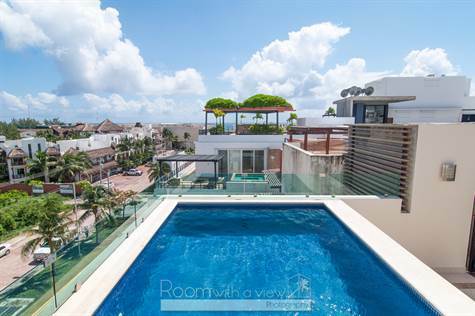 Located in one of Playa del Carmen’s most popular neighborhoods, Coco Beach, this gorgeous, modern ocean view penthouse has all the amenities you desire for ultimate comfort and convenience. This elegant penthouse features an open floor plan design with a fully equipped, modern kitchen, formal dining room and a spacious living room. The main living area is bright and cheerful, featuring large floor to ceiling windows with sliding doors leading out to a wrap-around terrace. There are 2 large bedrooms. The master has its own private terrace and each has an en suite bath, offering plenty of room and privacy for you and your family to comfortably vacation in style. Just above, accessed by a private interior stairway, is an enormous rooftop lounge with a built in kitchen, fire feature and private pool, all looking out to the Caribbean Sea and Cozumel. This is the perfect place for you and your vacation guests to take in the sun, have a cook out or host an elegant cocktail party under the stars. There is also a larger common pool area with plenty of loungers where you can get to know your fellow residents. Due to its desirable location and its luxurious amenities, this complex has a fantastic rental history. You and your guests will certainly enjoy the fantastic location this ocean view condo for sale in Playa del Carmen has to offer! Just steps away from Coco Beach, you can spend countless hours on the beach, lounging in the sun, swimming or paddle boarding. Should you desire, some of Playa’s hottest beach clubs like Canibal Royal and Mamita’s are within an easy walk. In the evenings, head a few blocks west to Playa del Carmen’s famous 5th Avenue, the place to go for shopping, people watching and savoring all the culinary delights that this diverse region has to offer. This penthouse is offered fully furnished and equipped including a washer and dryer. The sale includes one dedicated off-street parking space. Contact our agents today for more information about this fantastic ocean view condo for sale in Playa del Carmen! !